Two years ago, a fire was kindled and it promised to grow. But life has a funny way of taking turns and making it difficult to find your way. We all started wondering whether the fire was going out and we would watch another dream being snuffed out before it could fly. I am writing this post to tell you that from ashes a phoenix shall rise! Yes, you read right! Phoenix Fire is in the making. 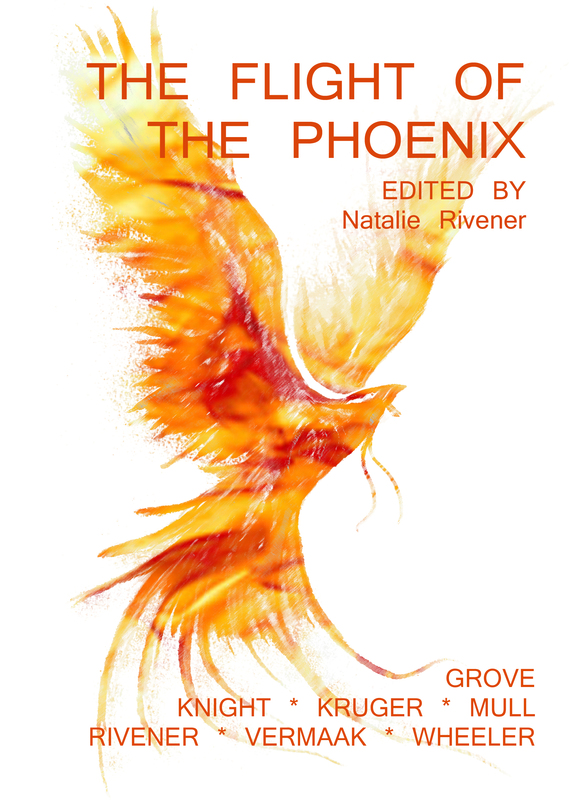 My South African writer friends are putting on their writer hats and we’re putting together an anthology to follow up The Flight of the Phoenix. This time around, the target audience is narrowed down to YA (young adult) only, though the genres will stay fantasy, science fiction and horror. Keep your eyes open for more posts as we fight the dying of the light! This is your chance to hear me displaying all kinds of bravado on Release the Geek, the official GeekXP.co.za podcast! All in all, I think it went quite well. And I put my foot in my mouth less often than usual. It’s time to get your hands on The Flight of the Phoenix!!! Pre-orders are open! Now, since we are not in charge of how our platforms work, we’ve had to get creative with how we’re doing pre-orders. CreateSpace (print-on-demand via Amazon – so, worldwide distribution) and Amazon (eBook). To get your pre-order discount, please contact us via our Facebook page and I will personally send you a coupon code. For our local South African print run pre-orders, contact all authors directly. We are all reachable on Facebook. Please note: The pre-orders are limited to the period before 16 July 2015. From there on, they will be available only at the full price, so, don’t wait! Get your discount now! Leave us a review on Goodreads if you like it! The Flight of the Phoenix – RSA print run pre-orders open! The South African print run The Flight of the Phoenix is finally open for pre-orders! This fantastic anthology has been long in the making, but it has been worth the wait! You will be hard pressed to find another anthology with such a good selection of fantasy, science fiction and horror stories. If you order before the end of June, you will receive a 25% discount on the normal price of R150*! This means you will be paying only R112.50* per copy you order. *Please note that the price does not include shipping! Thank you for your support and encouragement. You’re making our dreams a reality! If you do not live in Gauteng or anywhere near South Africa, do not despair! We will be doing print-on-demand and ebooks on Amazon! However, the pre-orders will only open in June. Flight of the Phoenix – it’s happening! I’ve been keeping this under wraps but, despite my many misgivings, it looks like Flight of the Phoenix will be making its appearance in the next two months! Flight of the Phoenix is an anthology of fantasy, sci-fi and horror short stories written by seven different South African authors. Though anthology is aimed at teens to young adults, I have tried hard to get all my writers to provide stories that was wide-audience compatible (i.e. if you are not a teen or young adult, the stories are still enjoyable – like Harry Potter). It has been long in the making but it’s finally looking like we’re moving ahead! Where did I find all these authors? I actually started off with 15 writers last year when I decided to jump in head first and compile an anthology. They all seemed keen…but, as time passed, about half of them fell out claiming life interfered, they didn’t have any ideas at the moment, work was eating their time, they weren’t willing to adapt according to feedback received… You know, the standard stuff. At least, one of the writers said “No” because she was busy writing on another story that was taking a lot of time. Depending on whether my fellow writers are keen on doing hard copy as well, the release date will be either beginning of April (if it’s to be an ebook only) or June (if we’re doing print too) this year. Why the hold-up if we do print? Well, I’d prefer bringing out all the formats at once, rather than it appearing in drips and drabs. And…I happen to be expecting the arrival of my second child midway through April…I can promise you: Nothing will be happening in my life other than keeping my family alive for a month after his arrival. Updates on progress to follow soon! To my SAfrican fans: Pre-orders are open! It’s time! The Pretoria Writers Group anthology, STORM, is coming out in June 2014 and the pre-launch sale is on! This is your chance to get your hands on a print version of STORM (Volume I and/or II)! If you’d like to pre-order a copy, use the contact form below.